There’s Going To Be A Bill And Ted 3. Excellent! Keanu Reeves has made me a very happy girl. During an interview with MTV News to promote his upcoming movie with Vera Farmiga, Henry’s Crime, the mysterious – and often mum – actor basically confirmed there’s going to be a third installment of the Bill and Ted movies. I am so excited. It’s like a little piece of my childhood has grown up and followed me into adulthood. Now, before you get all pissy and start calling me a hypocrite because I just said the other day that I don’t like it when iconic shows and movies are retooled and updated, a third installment of Bill and Ted is not a revamp – it’s a sequel. There’s a difference. According to Keanu, the new movie will pick up where Bill & Ted’s Bogus Journey left off, when Wyld Stallyns became the best band in the universe. Strange things are afoot at the Circle K…..
previous post: Richard Hatch Needs Money. Lots And Lots Of Money. 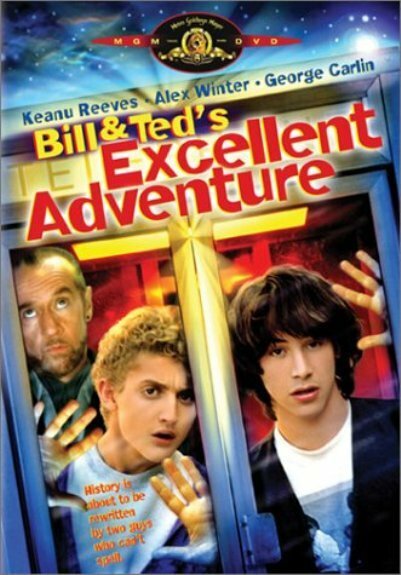 This is great because bill and ted’s bogus journey was totally bogus. Third time’s the charm!! I didn’t mention this in my post – because the thought just entered my head – but I’m stoked Bill and Ted are going to be played by the same people. There’s nothing worse than a sequel with different actors! 55 queries in 0.707 seconds.